Fenton recently worked with Yarra Ranges Council to consolidate and refine their existing brand guidelines. The result was an easy to use ‘kit of parts’ consisting of the logo, colour palate and typeface. But this is just the starting point of a system for developing creative communication solutions that allow the Council to connect to different audience groups in the Yarra Ranges community. Consistency has long been a tenet of brand guidelines, and given the breadth and variety of local government work, recognition of a council’s visual identity is essential to maintaining and building public reputation. The ‘kit of parts’ system allows for the development of an identifiable look and feel when needed, using a text-based wordmark set in the Council’s corporate typeface. The Council logo always appears prominently alongside. 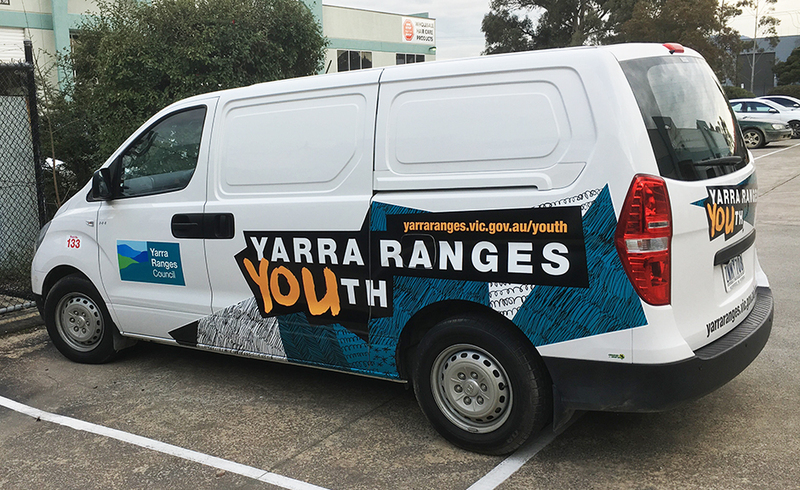 The first council department to implement this approach was Yarra Ranges Youth. Fenton facilitated a workshop with a group of young people from the local area to determine a brand personality and messaging that would resonate. Using the kit of parts, we then created a customised wordmark and paired it with a series of contemporary illustrations. A simple series of templates allow for a degree of creative freedom with consistent branding. We’re proud to see the brand being applied to some of Council’s fleet of vans.